From Spider Webs to Snail Slime all the way to KinderNature! Spider Webs to Snail Slime was the title of an environmental education professional development workshop presented by Linda R.F. Zaletel in the mid-1990s at the Midwest Environmental Education Conference and other locations. While Linda truly enjoys the energy and enthusiasm of preschool-age learners, other non-formal educators can be a bit intimidated! Linda’s own enthusiasm was as infectious as those of 3, 4, and 5-year olds and several of us were hooked! Preschool programming was a large part of the environmental education program at Story County Conservation in the 1990s as well, thanks to Linda R.F. Zaletel. Preschool classes would visit McFarland Park in the spring and fall and Linda would also take “activity tubs” to the preschool classroom. In 1997 Debbi Williams was an intern at Story County Conservation and taking an idea from Linda she created a booklet called “Nature Box Activities” which included a few tubs to be checked out with the activities inside. Thus was born the first idea for the KinderNature website. Utilizing Linda’s activities and ideas, an Iowa DNR Resource Enhancement and Protection Conservation Education Program (REAP-CEP) grant was received in 1997, along with support from Story County Conservation, to develop “Nature Boxes for Early Childhood Educators.” This grant was still in use in Story County Conservation educational programs in 2005. The nature box program was presented at the National Association for Interpretation – National Interpreters Workshops in Tucson, Arizona, 2000 and Des Moines, Iowa 2002, and at the Iowa Conservation Education Coalition’s Winter Solstice workshop in 2004 and 2005 at Strawberry Point. Toddling on the Wild Side was developed in 2003 by Wendy Zohrer of E Resources Group, Ginny Malcomson, and Jennie Grove. The purpose of ‘Toddling” was to provide parents with age-appropriate activities to engage with their young children outside. The program was offered in Des Moines, IA for one hour at many of the local parks in the area. 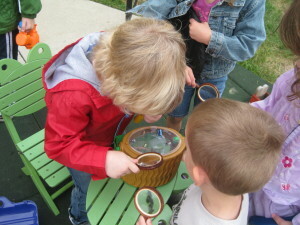 In 2005, the preschool activities and offerings from “Nature Boxes” and “Toddling on the Wild Side” morphed into KinderNature. KinderNature became a website hosted and maintained by the Story County Information Technology (IT) Department and funded by a REAP-CEP grant (2005), Story County Conservation, and E Resources Group. KinderNature workshops were presented on the Iowa Public Television’s statewide ICN in 2005-2006; Child Care Class at Des Moines Area Community College for statewide caregivers 2005; Iowa Conservation Education Council Midwest Environmental Education Conference in 2005; Iowa State University’s childcare workshops in 2005, and at the Iowa Family Child Care Association meeting in 2006. An article by Zaletel entitled “Naturalist in a Box” was published in the National Association for Interpretation “Legacy” magazine in 2003. Website development has changed tremendously since KinderNature’s inception and Story County’s IT department upgrades in July 2014 meant that KinderNature site was taken down. In 2015, the Iowa Conservation Education Coalition (ICEC) received a REAP-CEP grant to revamp the website and correlate the resources with the Iowa Early Learning Standards. ICEC maintains this site so that educators and parents have a reliable site to obtain quality outdoor activities and programs. Ginny Malcomson, Linda R.F. Zaletel, and Wendy Zohrer, the 2005 KinderNature development team thank their family members, Jim; Rob and Lauren; Hank, Anne and Libby for their loving support. The project team also gave a special acknowledgement to Betty and Russ Ford, Isabel Wasson, and Marlyn Smith for their inspiration. KinderNature 2005 was developed in remembrance of Rachel Carson and her book The Sense of Wonder. We hope this website will encourage each of you to find that “sense of wonder” in your classrooms and sites. Jerry Keys for the KinderNature name! Iowa Public Television and the Iowa Communication Network (ICN) for their support in training early childhood educators, and interest in the environment! Iowa Association for the Education of Young Child (Iowa AEYC) for their knowledge and their support of this project! Resource Enhancement and Protection Conservation Education Program (REAP-CEP) board for their continued support of environmental education. Minnesota Early Childhood Environmental Education Consortium and Marcie Oltman, editors of Natural Wonders: A Guide to Early Childhood for Environmental Educator; Helen Bartee, Fontenelle Forest; Children’s Museum – Minneapolis; Julie Miller, Heidi Skiba, and other leaders in the field of environmental education and early childhood education. A big thank you to Linette Bernard, Missy King Smith, and Barb Gigar for updating the KinderNature website! April 22nd is Earth Day! Just because toddlers are small, doesn’t mean they can’t help make a difference. Go on an Earth Day hike, pick up trash in your neighborhood, or sort and separate recyclables. If you want to be on our Early Childhood email list to hear about upcoming training and to receive supports to help you get your children outside, please sign up here.